New patients are always welcome and we look forward to meeting you and helping you achieve the healthy smile of your dreams. 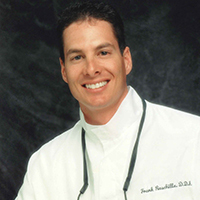 The dental office of Frank L Raschilla is committed to providing our patients exceptional, personalized dental care utilizing the highest technology and latest materials in a reassuring, comforting manner. Dr Raschilla and his staff all have decades of experience in the dental field and we feel that a warm, caring dental "family" atmosphere is as important as providing our patients high quality, long lasting dentistry. Imagine having dentistry performed in a comfortable, relaxing atmosphere by highly trained and experienced professionals dedicated to your positive experience. Dr Raschilla welcomes dental questions and we are always available to take the time to explain your dental issues and proposed treatment. We are dedicated to helping you understand your dental health! Whether you need routine cleanings, general dentistry, crowns or teeth replaced we are qualified and capable of providing you the best dental care available. For an appointment click here or stop by to see our amazing view of the Sierra Nevada Mountains.